An affordable auto insurance premium is important, but having a good insurance company that will pay your claims is important too! We'll help you save money by making sure you get every possible discount while using quality companies like those shown below. Click on any of the logos below for more information. 1. We'll Shop the companies for the lowest auto insurance rate. We are not limited to one insurance company like some agents. Everyone's situation is different and it's our access to multiple insurance companies that can make a huge difference in how much you can save. Let us show you how much! 2. We'll apply every possible discount. Our experienced underwriters will make sure you get full credit for your auto features including the following discounts. 3. We'll guide you through the process of securing your discounts. Our agency underwriters will work with you to make sure all the necessary items are provided to the insurance company to secure your car insurance discounts. It's easy to quote a discount, but it takes experienced underwriters to make sure you receive it. 4. We'll help you to understand your coverage. Understanding the coverage options is critical to getting the coverage that fits your situation. Our agency underwriters will take the time to explain all the auto insurance coverages and options. We know you want to have enough coverage for your situation, but not also pay for something you might not need. 5. We'll be here to help you with any claims you may have. We know a claim is the "moment of truth" where we are called upon to deliver on our promises. 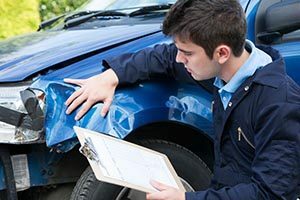 We'll help you report your claim immediately, follow up to be sure an adjuster comes to see you and assist in any way possible until your car insurance claim has been paid in full. We offer free auto insurance quotes for the residents of Miami, Coral Gables, Kendall, Pinecrest, Cutler Bay, Palmetto Bay, Homestead and other South Florida communities. If you, or any passengers, are injured in an accident, medical costs can be extremely expensive. If you, or your car, are responsible for damage or injury to others, you may be sued for much more than you're worth. Liability coverage covers bodily injury to others and property damage to others if you are at fault in an accident. Bodily injury pays others’ medical costs. It can also pay injured parties’ lost wages and your legal expenses. Property damage coverage can also pay for your legal expenses if a lawsuit is brought against you due to an accident. Comprehensive Coverage helps pay for damage to your vehicle not caused by collision. Examples include: damage or loss due to theft, vandalism, falling objects, fire, storms, flood, and certain other natural disasters. Collision Coverage helps pay for damage to your vehicle if you hit another vehicle, if another vehicle hits you, or if your vehicle rolls over. Collision coverage can be a required part of your car insurance coverage if your vehicle is financed or leased. Helps pay for damages to your vehicle if it is damaged in an accident by an uninsured, underinsured or unidentified driver. Uninsured or underinsured motorist coverage also helps pay your medical costs and your passengers’ medical costs if an accident caused by an uninsured or underinsured driver results in injury. This car insurance coverage may also pay for lost wages and other damages. Helps pay medical costs for you and your passengers in the event of an accident, regardless of who is at fault. PIP is a statutory coverage which provides medical, disability and death benefits for persons injured in or by the insured's vehicles, without regard to fault. Named insureds and their family members are also covered for injuries in or by the vehicles of others. Helps pay for your rental car or other transportation (such as bus or subway) if your car cannot be driven due to an at–fault accident or comprehensive claim. Reimburses for towing and roadside assistance charges if a vehicle with car insurance coverage is disabled. Typical services include: battery jump-starting, tire changing and locksmith services.